My practice has developed in many ways during Drawing 1. I found one of the most useful areas of development was the practice of reflection on my blog. Learning to reflect on my own work – looking at where something has worked and where it could be better – has been incredibly useful to my development. I am still learning to reflect on other artist’s work – in exhibitions, books and documentaries – especially in the context of my own work. It is definitely an area I wish to build on in future. As I worked through the course, several areas sprang out for me. The first was my attraction towards hints of the uncanny in art. (Contact sheet 1 & 2). I have looked at artists such as Peter Doig who create atmospheres of unease and mystery. In my own work I identified a small doll in one drawing (No. 1) and put it in my final piece for Assignment 2 (No. 2). 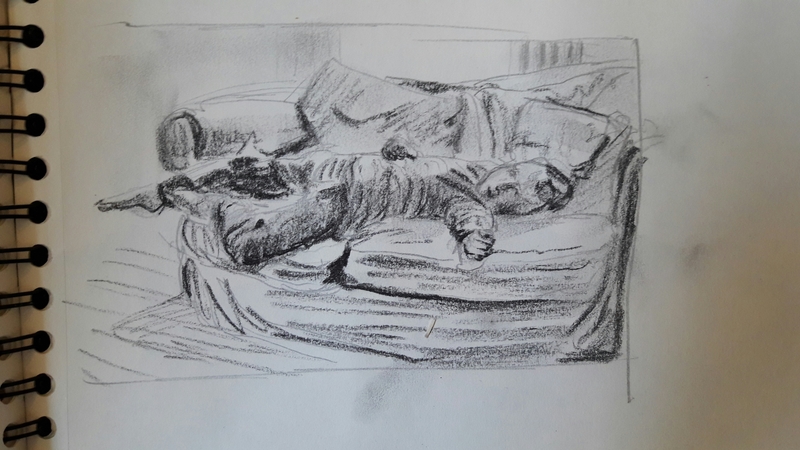 The second area where I found interest was in making a drawing which creates a sense of life – by which I mean using line, composition and tone to create a feeling of energy. This started in drawings of trees (No. 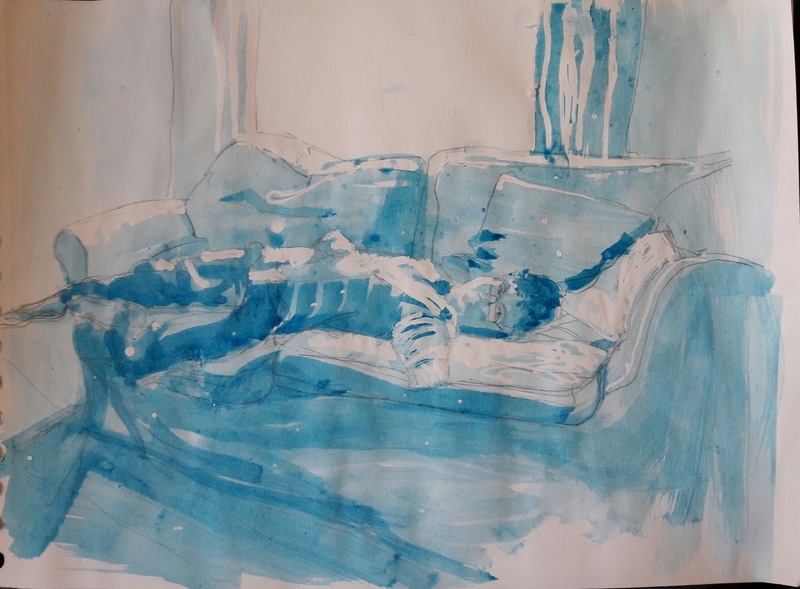 3 & 4) and developed further in life studies where the volume of drawings I made and the chance to experiment with different media meant I produced some strong and vigorous drawings (No. 6 and 7). It was in life drawing that I first started to study the body in movement which I developed in Assignment 4 with an A1 drawing of my son (no 8) and Assignment 5 with another drawing of him poised for movement (no. 10). While I wasn’t completely happy with Assignment 3, I have submitted it (No. 5) because I learned so much from making it. While I enjoyed making the textures in the foliage and drawing the trees, I felt the overall composition was quite static and the detail over-fussy. This encouraged me to work more loosely and boldly in Assignment 4. The third area I felt I developed was in my approach to a particular area of interest. An “investigation”. While this is an area where I still have much to learn, I really enjoyed exploring an idea, approaching a subject from different angles and exploring composition and media. I submitted my self-portrait (no. 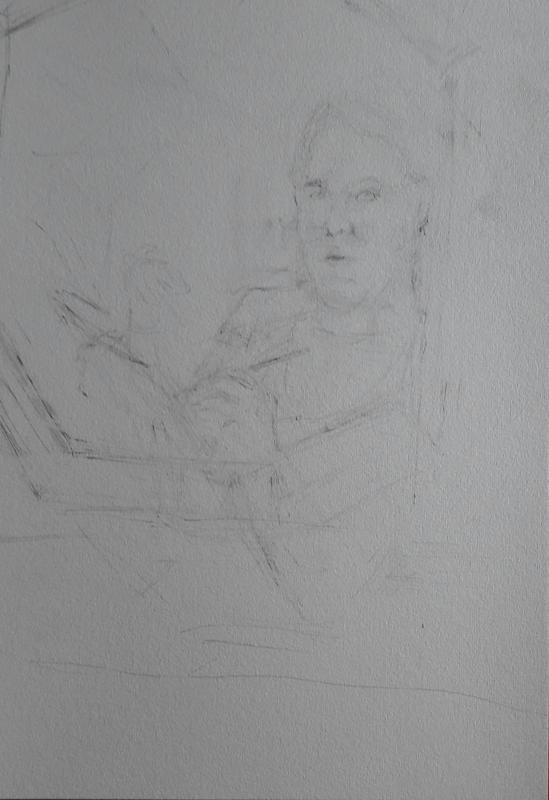 9) and supporting work because I experimented with a number of approaches based on other artists such as Frank Auerbach and Jenny Saville’s use of reduction in their drawing methods. 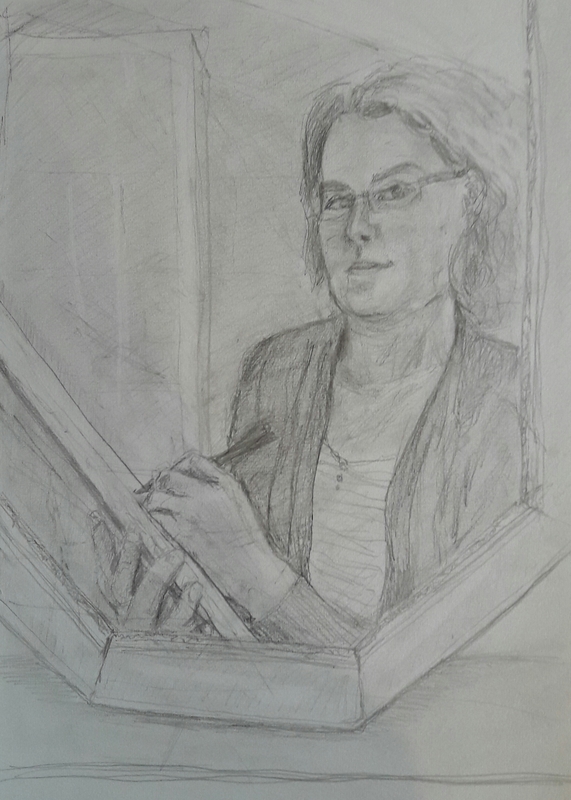 I drew in a variety of different ways and received useful tutor feedback before producing my final self-portrait which I felt was stronger because of the preliminary work. This was also the case in Assignment 5 (No.10.) “Being a child” where I moved from drawings of a child in a landscape to a child in a room to a cropped image of a child balancing on a sofa. This seemed a satisfying conclusion to my search for a way to represent the movement and the inner world of a child. I spent some time reflecting on the use of photographs when drawing. Looking at artists such as Elizabeth Peyton was useful to me in this. I am still exploring how to use photographs and video as a source while creating something completely original. I noticed as I progressed that lessons learned in one module fed into work in another. For example, a study of using colour to represent tone in Part 2 fed into a life drawing (No.7) in Part 4. My tutor’s feedback has been very useful during this process. In particular, she encouraged me to look at what works in my own work and other artists’ work, made useful comments which have helped me work on my composition and reflect on strategies to produce successful work. Two things influenced the way I approached this self portrait. The first was the work of Frank Auerbach and Jenny Saville who use reduction as part of their drawing method. 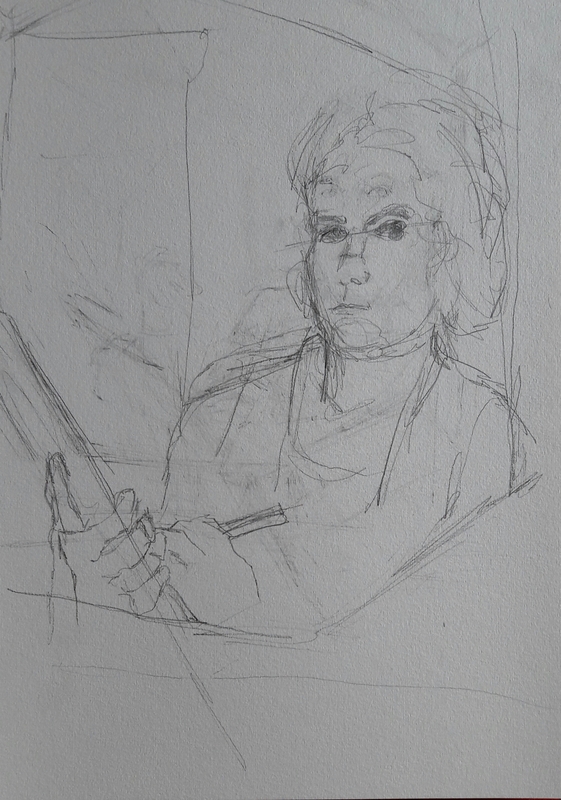 They draw then rub out, then draw and rub out over and over again in theory getting to the essence of their subject. 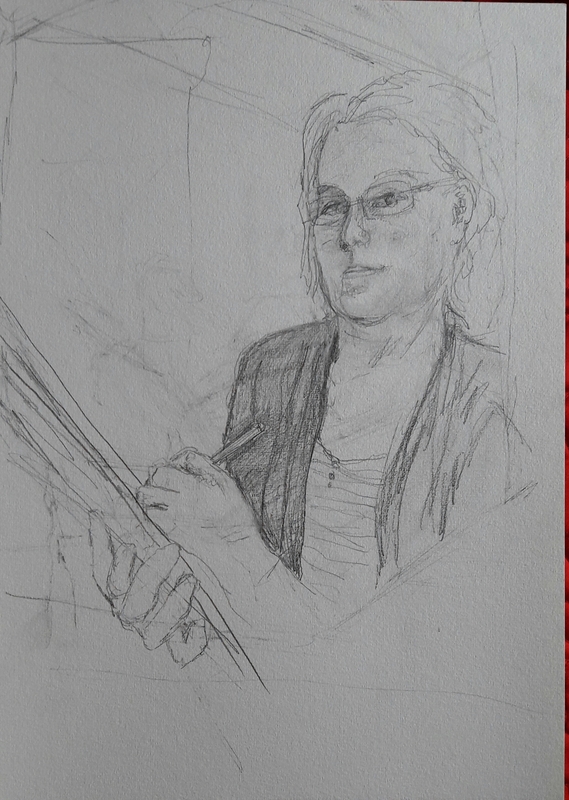 The second was a friend’s reaction to two self-portraits I did earlier in Part 4. “Is that how you see yourself?”, she asked, sounding surprised. It made me realise I had tried to draw how I looked rather than who I was. I decided to do all my work on one piece of paper. Drawing and rubbing out and hopefully getting closer to who I think I am. I based the work on some preliminary sketches I had already done. Taking on board my friend’s comment I decided to try to look more cheerful and to include my hands, drawing pad and pencil in the picture. 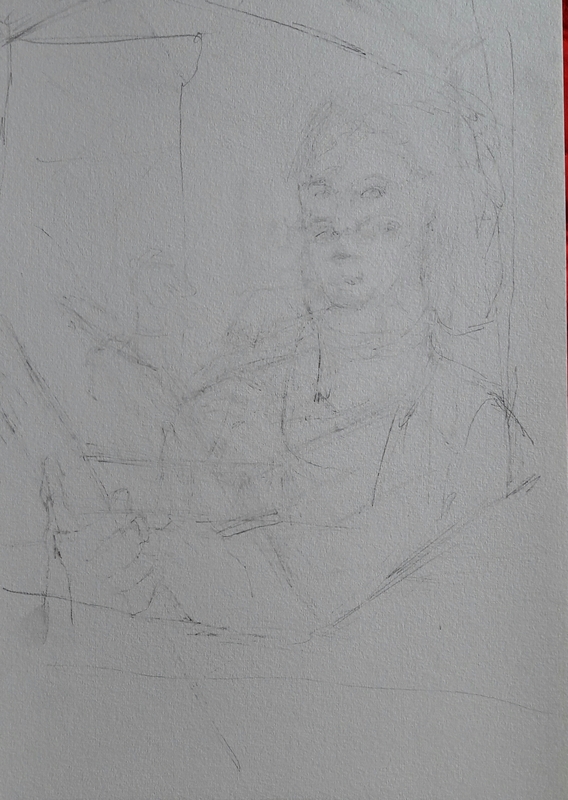 It was only after I had rubbed out the drawing the first time and drawn over the remains that I realised I should be photographing each stage so here are the next stages. When I reached Fig. 5. I had to decide whether to rub out again or carry on to a completed piece. While it would have been interesting to carry on with the process I was conscious of a deadline approaching. I would also have found it much harder to rub this one out as I liked it much better than the other drawings. I decided to complete the drawing (Fig. 6). I slightly regret stopping here as it would have been a real challenge to carry on deleting and redrawing. I’d like to develop the stamina and confidence to do this. I also originally thought I might start incorporating different media and deleting by painting out marks to erase them. This is something I’d like to look at in further work. I have been wanting to draw my son, who is 8, for a while now. He is never still and always pulls a silly pose if I try to take a photo of him. I knew I would have to draw from a photograph if I wanted to draw him. 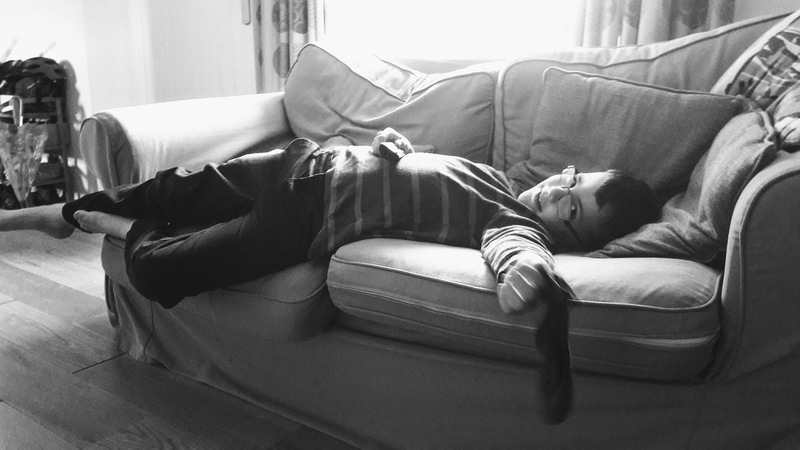 I managed to get him to lie on the sofa while I took his picture but you can see he is sliding off ready to run away. I took several pictures then chose the one I liked best. I did a few sketches mainly to try out different media. I like the drawing using ink and masking fluid but I didn’t feel I have the ability to make an A1 drawing in ink. In the photograph he is holding a remote control and a sock. When I drew the pose without the objects there seemed to be less of a reason for him to be in the position he was so I decided to draw them as well. I wanted to show him looking out at the viewer. I find children mysterious and I wanted to express this enigmatic quality. I like the light coming from behind the sofa. I painted watercolour paper with white emulsion mixed with some brown pastel. This was to add texture and a warmth to the picture. I drew on this with charcoal. 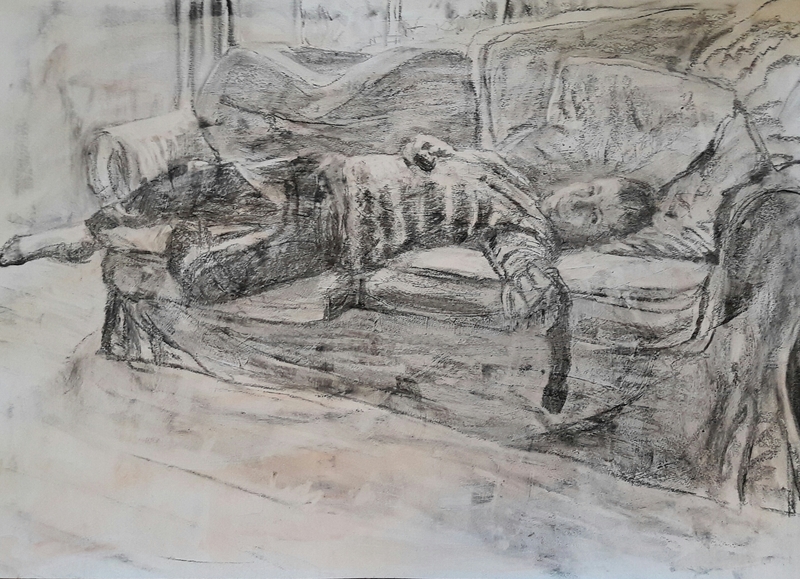 I chose charcoal because I knew from previous drawings that I can work with it on a large scale and it is very forgiving of mistakes and good for expressing tone. Generally I am pleased with the drawing although I think the photo I worked from distorted the image a little to which I added some inaccuracies in the drawing. This has lengthened the image horizontally. In his self portrait, artist Frank Auerbach seems to use a series of simple zig zag lines to depict his face. Behind the final marks are the remains of previous mark-making which is then rubbed out building up an interesting surface and showing the artist working out the image. To Auerbach, erasure is as important a way of making a mark as using a pencil. In Portrait of EOW Auerbach has painted then scraped away the paint until the paper falls apart and is patched and repainted. I find this technique of mark making then erasure interesting when making a portrait. You can never truly know a person so each time you are attempting to get closer to the truth but never really achieve it. It seems to acknowledge imperfection of art while at the same time making something worthwhile – a portrait of looking at someone. Graham Little draws from photographs of women in old magazines. His drawings in gouache and coloured pencil are meticulous and slightly creepy. It feels like he is referencing classical art – but I can’t put my finger on which painting any one of his drawings refers to. Maybe they are generic rather than specific. The women make tea, fold washing, talk on the phone or just sit. A photograph is a frozen moment in time. 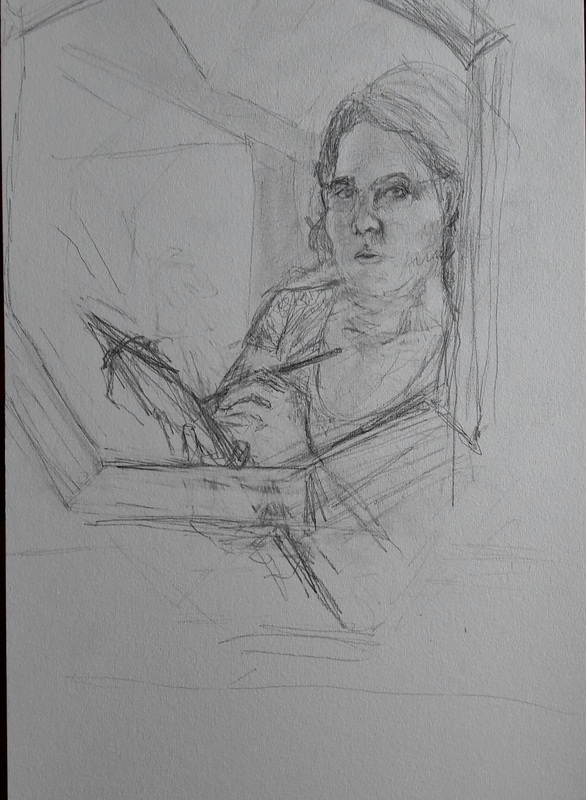 To then draw the frozen moment – to spin out the moment for months – imparts a certain quality to the drawing. Like these women are specimens for the artist’s pleasure. The women look bored and trapped. Elizabeth Peyton uses thinned oil paint or watercolour to depict famous actors and singers as well as friends and boyfriends. All her portraits share a look – pointed chin, pale skin, red lips. Her compositions are dynamic and unusual and she uses the patterns in clothing and backgrounds as a foil for her drawings. This is my assignment 3 drawing which is a view at Durham Botanic Gardens. 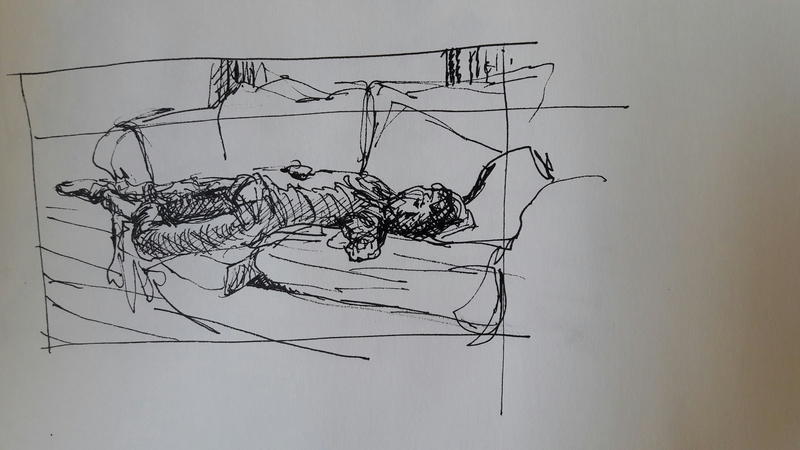 I went on a sketching day with Interface Arts a group of professional and semi-professional artists based in County Durham. They have funding towards an exhibition based on gardens in County Durham later in the year. I joined Interface with a view to making contact with other artists and gaining opportunities to exhibit work. 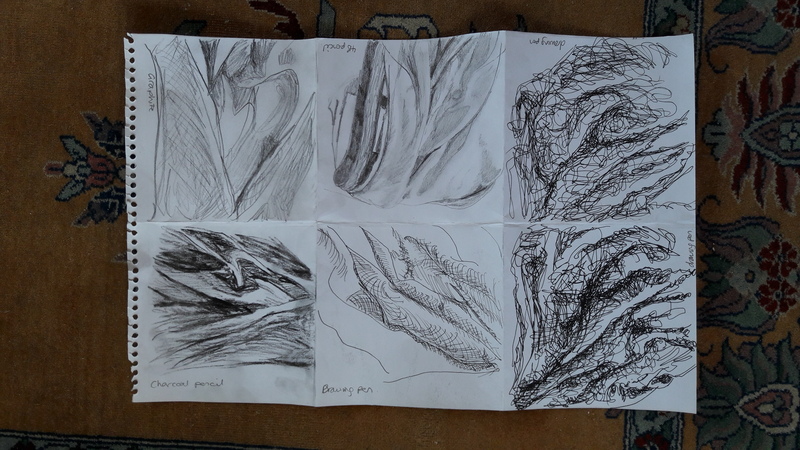 My prompt note for assignment 3 was: “A drawing with plants, a structure and a feeling of depth.” I had trouble with this – all my exercises seemed to have 2 out of 3 – plants and a structure but no feeling of depth; plants and a feeling of depth but no structure. At the Botanic Gardens I came across a little gazebo looking out over a pond and path. I sketched out rough compositions in my sketchbook. I also took a lot of photos exploring composition and viewpoints. I made the final drawing at home using a variety of photographs. I experimented with masking fluid and decided to remove a large spiky plant in the foreground to open up the view. I found it hard to “fill in the gaps” where my sketches and photos didn’t have the information I needed for elements of my drawing – for example – where I removed the plant. I was quite disappointed in the final drawing. I felt the composition wasn’t as dynamic as it could have been – for example, the path is straighter than it was in my initial drawings. I like the areas in the background using masking fluid which created lively and quite abstract blocks. I learned to more accurately assess the amount of time it will take to make a drawing. It would also have been useful to plan a second visit to enable me to fill in any gaps. I will continue to work on understanding composition and also experiment with making my work looser and less detailed as I think the final drawing became too detailed. In this assignment I feel I have progressed in composition and developed my sketchbook work to explore composition and techniques. In this assignment piece I used masking fluid for the first time (after trying it out in my sketchbook). I also removed a plant that was too dominant in the foreground which is the first time I have altered a composition to make it look more interesting. The work was based on in situ. sketching in Durham Botanic Gardens but I also took photographs which informed the detailed work in the final drawing. While there are elements of the drawing I like – the more abstract trees in the background and the swirly plants in the right foreground – I could have made the composition more interesting and I didn’t observe the beam in the roof of the gazebo properly in my sketches or photographs so it is a little bodged. I also am not sure about the almost square final composition, I had originally envisioned a much more panoramic view of the garden but, to be frank, ran out of time (having already spent 9 hours drawing) and also hadn’t recorded the scene in enough detail to draw the wider view. Finally I feel the work generally is too detailed. I prefer the more abstract areas and will take this forward into future work. 2) Quality of outcome – content, application of knowledge, presentation of work in a coherent manner, discernment, conceptualisation of thoughts, communication of ideas. I think the final piece gives a feeling of depth and of sunlight and shadow which is what I was hoping to achieve. It is a very detailed piece and is how it occurs to me to respond to this landscape, however, I am aware that some of the artists I have studied such as Georgia O’Keefe create landscapes with little to no detail. However, others such as Peter Doig and Pierre Bonnard are more decorative and detailed. I would like to look at other ways to reflect landscape with less detail. 3) Demonstration of creativity – imagination, experimentation, invention, development of a personal voice. I think the composition is creative with the dark wooden post and beams in the foreground framing the view and I have experimented with masking fluid and watercolour which I haven’t used very much before. The subject itself is a bit “conventional” – a pretty view, a path, flowers, a pond. I really struggled with finding a subject that fitted all the criteria in the assignment and this felt a little like a compromise. I am aware that I haven’t used my sketchbook as much as I could to take an idea through experimentation to completion and recently attended a sketchbook course (after completing this assignment!) I hope to take what I learned into my next assignment. 4) Context reflection – research, critical thinking. During the course of Part 3 I have looked at a wide variety of artists including those mentioned above as well as Albrecht Durer, Claude Lorrain and Claude Monet. I also went on study visits to Sirkka-Liisa Konttinen in Newcastle and Degas to Picasso at the Ashmolean. I enjoyed the film “ Exhibition on Screen: I Claude Monet” which explored Monet’s life through his letters read out by an actor while the film showed the work he was producing at the time. There were certain techniques I wanted to find out more about so I researched oil pastels and also found a useful video on composition.